As I write this, I am about 90 percent sure my wedding ring is somewhere in or around our house. I am 100 percent sure it’s not on my finger. That is a problem, but not an entirely unprecedented one. I lose things all the time–like it’s a hobby of mine. In addition to that chunk of platinum, at the moment I can’t locate at least one set of headphones (they ought to be in my home office, but who knows? ), a steamer basket (it’s somewhere in the kitchen, just not anywhere I’ve looked) and a Metro Smartrip card (which I thought I’d left at my mom’s house, but it wasn’t in any remotely obvious spot there, so maybe it’s around here too). A wedding ring is worth immensely more, in monetary and sentimental terms. It annoys me greatly that I haven’t been able to find it since last week. Which, in turn, meant I had to travel without it earlier this week–and that bothered the hell out of me. 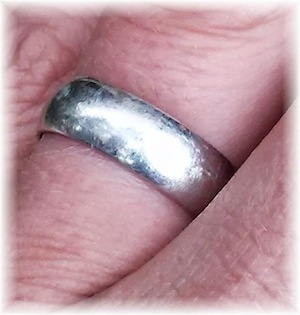 So far, I’ve established that my ring is not in the kitchen or dining room (where I remember taking it off, annoyed at how tight it felt in the typical D.C. heat and humidity) or near my nightstand (where I would have normally left it). I thought it might have rolled into the heating/air-conditioning vent in the floor in either room, but opening the ductwork in the basement revealed nothing but stray chunks of plaster. Did I put it in the pocket of the shirt I was wearing, which I then threw on the next morning to do a little gardening, at which point it could have fallen out? I haven’t seen any sign of it outside. At least the house is getting cleaner as I inspect and tidy up each possible resting place. At some point, we’ll be able to slap tiny Bluetooth tags on important items, which our phones will be able to locate in seconds–and our phones, in turn, will be able to do more of the jobs now held by separate, easily-lost cards. But that’s not helping me today. The longer I fail to find this thing, the greater the odds of it being carried away by the dust bunnies indoors or the real ones outside. (Our neighborhood has been overrun by rabbits, to the occasional delight of our toddler.) But if give up and buy a replacement–of course it’s not insured, because I usually don’t take off my ring–that pretty much guarantees I will stumble across it at home the next day. I keep hoping that some flash of insight will cause me to remember the precise point where I put my ring down. Maybe the act of posting this confession will spark that–or, more likely, it will lend some comfort to the other poor slobs who can’t believe anybody could be so stupid as to lose something like this. Update, 9/2/2013: My old ring still hasn’t shown up, so I gave in and bought a new one. It’s not platinum like its predecessor–the price of that has gone up like crazy since 2003. Instead, it’s made out of tungsten, which is a lot more affordable, much more scratch-resistant and (this is important too) a much nerdier metal. This entry was posted in Personal, Travel and tagged lost and found, marriage, ring, wedding ring by robpegoraro. Bookmark the permalink. She and I both work in medicine, and so the rings have to come off from time to time. I make a point of putting my ring on my watchband, and then attaching my watch to the drawstring on my scrubs. She has other, obviously less effective methods. do you have a cat? That’s usually the issue in our house…..
At least I’m not alone. I lost my wedding ring a month or two after we were married and dug through a trash bin outside a Giant store (where I thought I mistakenly tossed it, as it was loose) only to find it on a soap dish in the shower the next morning. I lost my cell phone the week my daughter was due to be born, only to find it in some bushes 2 years later when doing some trimming. The latest was my fitbit, which was only found yesterday when I put on a suit I last wore 2 weeks ago. While bluetooth was useful to tell me the device was nearby (as it paired), it didn’t help because there’s no speaker or light to flash and indicate location. Yeah, I always have a specific spot for things, even at home, otherwise I lose them. Of course, I still somehow lost my wedding band a year or two ago, but after coming up empty in all the obvious spots, I eventually pulled my dresser away from the wall and found it back there. Now I just wear it 24/7 unless I have a good reason to remove it. When you’ve been married longer, you’ll perhaps be fortunate enough to have gained sufficient weight that your ring no longer comes off. Problem solved. As someone on their third wedding ring, I managed to buy an everyday ring on Amazon (a titanium one for $7) that can be replaced at will. My real one stays in the same case as my wife’s engagement ring (which she rarely wears as she works in a lab with some nasty chemicals). Inquiring minds want to know…have you found it yet? ?